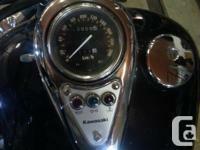 Windshield , Carrier, Backrest. 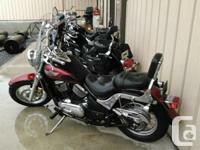 2007 KAWASAKI VULCAN 500 LTD IS A SMART CHOICE FOR VALUE-MINDED RIDERS. 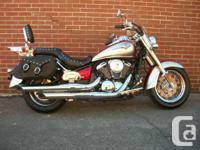 Cruiser style and affordable transportation. 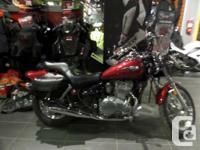 Kawasakis Vulcan 500 LTD is an excellent motorcycle for 1st-time buyers seeking entry to the cruiser lifestyle. With a low seat height, friendly power delivery and affordable purchase price, the Vulcan 500 LTD makes it easy to develop those all-important riding skills. Though it is compact and easy to ride, the Vulcan 500 LTDs ample power and comfortable accommodations mean more experienced riders will still enjoy its practicality, efficiency and reliability as a transportation tool. Based on the same engine that powers the Ninja 500R sportbike, the Vulcan 500 LTDs engine helps this cruiser outmuscle its competition. Its twin cylinder powerplant provides predictable torque delivery for boulevard cruising, while still offering plenty of extra muscle for highway trips. It takes more than an exceptional engine to make a great motorcycle, so the 500 LTDs chassis is equally user-friendly. A long and low steel frame contributes to its classic cruiser looks, and with a saddle thats just 28-inches from the ground, it puts just about any size rider at ease. As for style, the Vulcan 500 LTDs nod to the custom crowd includes a stepped seat, bobbed rear fender, tank-mounted speedometer and chrome-plated wire-spoke wheels. Admire it as is, or select additional enhancements from Kawasakis accessory line.Price does not included Hst or License Fee.